A hairdresser colors a client's hair. Hair coloring can be done professionally by a hairdresser or independently at home. Today, hair coloring is very popular, with 75% of women and 18% of men living in Copenhagen having reported using hair dye according to a study by the University of Copenhagen. At-home coloring in the United States reached $1.9 billion in 2011 and is expected to rise to $2.2 billion by 2016. Diodorus Siculus, a Greek historian, described in detail how Celtic people dyed their hair blonde: "Their aspect is terrifying... They are very tall in stature, with rippling muscles under clear white skin. Their hair is blond, but not naturally so: they bleach it, to this day, artificially, washing it in lime and combing it back from their foreheads. They look like wood-demons, their hair thick and shaggy like a horse's mane. Some of them are clean-shaven, but others—especially those of high rank—shave their cheeks but leave a moustache that covers the whole mouth...". This practice continued in some parts of Britain long after the Fall of the Western Roman Empire, particularly in Wales, where Llywelyn Ap Gruffudd was described in an elegy by Gruffudd ab yr Ynad Coch to have blonde hair: "...Not since Camlann has there been such weeping, Gone is our mainstay, his golden hair, stained with a death blow...". 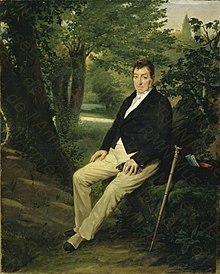 Portrait of Lafayette in 1830, aged 73, with pitch-black hair. The dyeing of hair is an ancient art that involves treatment of the hair with various chemical compounds. In ancient times, the dyes were obtained from plants. Some of the most well known are henna (Lawsonia inermis), indigo, Cassia obovata, senna, turmeric and amla. Others include katam (buxus dioica), black walnut hulls, red ochre and leeks. In the 1661 book Eighteen Books of the Secrets of Art & Nature, various methods of coloring hair black, gold, green, red, yellow, and white are explained. The development of synthetic dyes for hair is traced to the 1860s discovery of the reactivity of para-phenylenediamine (PPD) with air. Eugène Schueller, the founder of L'Oréal, is recognized for creating the first synthetic hair dye in 1907. In 1947 the German cosmetics firm Schwarzkopf launched the first home color product, "Poly Color". [non-primary source needed] Hair dyeing is now a multibillion-dollar industry that involves the use of both plant-derived and synthetic dyes. There are also newer coloring techniques such as ombré, in which hair is dark on the crown and bit by bit becomes lighter toward the ends. All coloring techniques can be used with any type of color. For lightening, the hair sometimes has to be bleached before coloring. Root touch-up, where color is applied only to the most recent section of re-growth (usually the first inch of hair nearest the scalp) Root touch-ups are repeated every 4–6 weeks as the natural color grows in and becomes apparent. People who color their hair to disguise gray often have these root touch-ups. The four most common classifications are permanent, demi-permanent (sometimes called deposit only), semi-permanent, and temporary. Permanent hair color generally contains ammonia and must be mixed with a developer or oxidizing agent in order to permanently change hair color. Ammonia is used in permanent hair color to open the cuticle layer so that the developer and colorants together can penetrate into the cortex. The developer, or oxidizing agent, comes in various volumes. The higher the developer volume, the higher the "lift" will be of a person's natural hair pigment. Someone with dark hair wishing to achieve two or three shades lighter may need a higher developer whereas someone with lighter hair wishing to achieve darker hair will not one as high. Timing may vary with permanent hair coloring but is typically 30 minutes or 45 minutes for those wishing to achieve maximum color change. Demi-permanent hair color is hair color that contains an alkaline agent other than ammonia (e.g. ethanolamine, sodium carbonate) and, while always employed with a developer, the concentration of hydrogen peroxide in that developer may be lower than used with a permanent hair color. Since the alkaline agents employed in demi-permanent colors are less effective in removing the natural pigment of hair than ammonia these products provide no lightening of hair's color during dyeing. As the result, they cannot color hair to a lighter shade than it was before dyeing and are less damaging to hair than their permanent counterpart. Demi-permanents are much more effective at covering gray hair than semi-permanents, but less so than permanents. Demi-permanents have several advantages as compared with permanent color. Because there is essentially no lifting (i.e., removal) of natural hair color, the final color is less uniform/homogeneous than a permanent and therefore more natural looking; they are gentler on hair and therefore safer, especially for damaged hair; and they wash out over time (typically 20 to 28 shampoos), so root regrowth is less noticeable and if a change of color is desired, it is easier to achieve. Demi-permanent hair colors are not permanent but the darker shades in particular may persist longer than indicated on the packet. Semi-permanent hair coloring involves little or no developer, hydrogen peroxide or ammonia, and is thus less damaging to hair strands. The reduced amount of developer, whether peroxide or ammonia, means that hair previously damaged by applying permanent color or permanent reshaping is less likely to be damaged during the color application process. Semi-permanent hair color uses compounds of lower molecular weight than are found in temporary hair color dyes. These dyes penetrate the hair shaft only partially, because of the reduced amount of developer used. For this reason, the color will survive repeated washing, typically 4–5 shampoos or a few weeks, before undergoing significant fading or washing out entirely. Semi-permanents may still contain the suspected carcinogen p-phenylenediamine (PPD) or other related colorants. The U.S. Environmental Protection Agency reported that in rats and mice chronically exposed to PPD in their diet, the PPT appears to simply depress body weight of the animals, with no other clinical signs of toxicity observed in several studies. The final color of each strand of hair will depend on its original color and porosity. Because hair's color and porosity across the head and along the length of a hair strand, there will be subtle variations in shade across the entire head. This gives a more natural-looking result than the solid, all over color of a permanent color. Because gray or white hairs have a different starting color than other hair, they will not appear as the same shade as the rest of the hair when treated with semi-permanent color. If there are only a few grey/white hairs, the effect will usually be enough for them to blend in, but as the gray spreads, there will come a point where it will not be disguised as well. In this case, the move to permanent color can sometimes be delayed by using the semi-permanent as a base and adding highlights. Semi-permanent color cannot lighten the hair. Temporary hair color is available in various forms including rinses, shampoos, gels, sprays, and foams. Temporary hair color is typically brighter and more vibrant than semi-permanent and permanent hair color. It is most often used to color hair for special occasions such as costume parties and Halloween. The pigments in temporary hair color are high molecular weight and cannot penetrate the cuticle layer. The color particles remain adsorbed (closely adherent) to the surface of the hair shaft and are easily removed with a single shampooing. Temporary hair color can persist on hair that is excessively dry or damaged in a way that allows for migration of the pigment to the interior of the hair shaft. 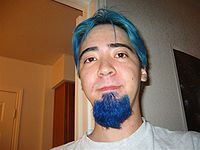 Hair and beard colored blue. Alternative hair coloring products are designed to create hair colors not typically found in nature. The available colors are diverse, such as the colors green and fuchsia. Permanent alternatives in some colors are available. Some color shades are blacklight-reactive, and thus show up under certain nightclub lighting, for instance. The chemical formulae of alternative color dyes typically contain only tint and have no developer. This means that they will only create the bright color of the packet if they are applied to light blond hair. People with darker hair (medium brown to black) need to use a bleaching kit before tint application. Some people with fair hair may benefit from prior bleaching as well. Gold, yellow and orange undertones in hair that has not been lightened enough can adversely affect results, especially with pinks, blues and greens. Although some alternative colors are semi-permanent, such as blue and purple, it could take several months to fully wash the color from bleached or pre-lightened hair. Hair coloring involves the use of chemicals capable of removing, replacing, and/or covering up pigments naturally found inside the hair shaft. Use of these chemicals can result in a range of adverse effects, including temporary skin irritation and allergy, hair breakage, skin discoloration and unexpected hair color results. According to the International Agency for Research on Cancer (IARC), in vitro and in vivo studies (in exposed human populations) have shown that some hair dyes and many chemicals used in the hair dyeing process can be considered mutagenic and carcinogenic. In certain individuals, the use of hair coloring can result in allergic reactions and/or skin irritation. Individuals allergic to gluten for example, will need to be cautious when purchasing hair color since certain hair dye includes gluten. Gluten does not need to be ingested for it to cause an allergy. Skin contact with gluten may cause a reaction; therefore, leading to an allergy. Symptoms of these reactions can include redness, sores, itching, burning sensation and discomfort. Symptoms will sometimes not be apparent immediately following the application and processing of the tint, but can also arise after hours or even a day later. To help prevent or limit allergic reactions, the majority of hair color products recommend that the client conduct a patch test before using the product. This involves mixing a small quantity of tint preparation and applying it directly to the skin for a period of 48 hours. If irritation develops, manufacturers recommend that the client not use the product. European dermatologists have, however, strongly advised against such pre-use testing, as it entails additional sensitisation (allergy) risk and the interpretation by lay people may not be sufficiently accurate. Hair that has been damaged by excessive exposure to chemicals is considered over-processed. This results in dry, rough and fragile hair. In extreme cases, the hair can be so damaged that it breaks off entirely. The main cases of hair breakage are: Lack of moisture and oils, poor diet, stress, over processing or illness. Skin and fingernails are made of a similar type of keratinized protein as hair. That means that drips, slips and extra hair tint around the hairline can result in patches of discolored skin. This is more common with darker hair colors and persons with dry absorbent skin. That is why it is recommended that latex or nitrile gloves be worn to protect the hands. This discoloration will disappear as the skin naturally renews itself and the top layer of skin is removed (typically takes a few days or at most a week). Ways of preventing skin discoloration are to wear latex or nitrile gloves to protect the hands and also by applying a thin layer of petroleum jelly or oil-based preparation around the hairline. Gentle abrasives such as moist baking soda or a small amount of toothpaste applied with a toothbrush may also help remove the uppermost layer of skin and dye (neither removes just the dye). Acetone and nail polish remover are not considered effective; laundry detergent may sometimes work as may moist cigarette ash rubbed into the stained area. Several factors influence the final color of the hair following the coloring process. For semi-permanent and demi-permanent color, the final color is a blend of the natural color of the hair and the dye color. Bleached hair will often require pre-pigmentation before a color application. Dyeing bleached hair brown can result in grey or very ashy (grey sheen) hair. Previously color treated hair can react unpredictably with subsequent color treatments. Previous use of shampoos which deposit a layer of plastic on the hair can block the action of the dye. Coloring dark hair to achieve a desirable shade of blond requires bleaching, followed by a secondary color treatment. Bleached hair can still have a yellow or coppery shade. A violet-based color can cancel out yellow tones, and a blue-based shade will cancel out coppery orange. Porosity of hair can affect the final shade. Porous hair often absorbs more color, which sometimes results darker than expected. The salt lead acetate (the active ingredient in gradual darkening products such as Grecian formula) is toxic. Lead acetate trihydrate has also been shown to cause reproductive toxicity. Articles link the development of some forms of cancer (including leukemia, non-Hodgkin's lymphoma, bladder cancer, blood cancer, and multiple myeloma) with use of hair color. More specifically, prolonged use of permanent dark hair dyes can double a person's risk of getting some types of blood cancer. In 2004 a known human carcinogen, 4-aminobiphenyl or 4-ABP, was found in some commercial hair dyes. However, evidence is limited and inconsistent for the link between cancer from hair dye. Phenylenediamine is known to cause health concerns, such as skin irritation. Exposure to phenylenediamine can occur during manufacturing or during the use of hair dyes. According to the Product Safety Summary Sheet by DuPont, Para-Phenyenediamine (PPD) is labeled as toxic and can cause adverse effects on aquatic organisms and could cause long-term effects in aquatic environments. In October 2017, the leading breast surgeon Professor Kefah Mokbel published a meta-analysis showing that use of hair dyes might increase the risk of developing breast cancer by 20% among users. Permanent hair coloring requires three components: (1) 1,4-diaminobenzene (historically) or 2,5-diaminotoluene (currently), (2) a coupling agent, and (3) an oxidant. The process is typically performed under basic conditions. The mechanism of oxidation dyes involves three steps: 1) Oxidation of 1,4-diaminobenzene derivative to the quinone state. 2) Reaction of this diimine with a coupler compound (more detail below). 3) Oxidation of the resulting compound to give the final dye. The preparation (dye precursors) is in the leuco (colorless) form. Oxidizing agents are usually hydrogen peroxide, and the alkaline environment is usually provided by ammonia. The combination of hydrogen peroxide and ammonia causes the natural hair to be lightened, providing a "blank canvas" for the dye. Ammonia opens the hair shaft pores so that the dye can actually diffuse inside the fiber. These dye intermediates and coupler compounds can undergo oxidation and coupling reaction as shown in the scheme below to form high molecular weight products, which are trapped in the hair matrix and cannot be readily removed through washing. Various combinations of primary intermediates and coupler compounds provide a spectrum of shades of hair colors. The primary intermediates are aromatic para compounds, such as 1,4-diaminobenzene or 4-aminophenol. The coupler compounds (couplers) are meta-substituted derivatives of aniline. They come in three major classes based on the color that they produce when they react with the primary intermediate. Couplers are chemical compounds that define the color of the hair dye. Shown here are three red couplers (A, B, C), two yellow-green couplers (D, E) and a blue coupler (F). Blue couplers include 1,3-diaminobenzene and its derivatives. Red couplers include phenols and naphthols, such as 3-aminophenol (CAS#591-27-5), 5-amino-2-methylphenol (CAS#2835-95-2) and 1-naphthol (CAS#90-15-3). The combination of 2,5-diaminotoluene with the coupler 3-aminophenol gives a magenta-brown dye, while the combination of 2,5-diaminotoluene with the coupler 1-naphthol gives a purple dye. Yellow-green couplers include resorcinol, 4-chlororesorcinol, and benzodioxoles. These compounds produce broad-band absorption when they react to form dyes, allowing for more natural-looking hair colors. The combination of 2,5-diaminotoluene with the coupler resorcinol gives a greenish brown dye. In the third and final step, the product from the quinonediimine-coupler reaction oxidizes to the final hair dye. It was once believed that the dye forms in the above reaction bonds to hair permanently. It was later shown that the main reason that this reaction imparts a permanent color on hair by producing larger dye molecules, which is locked inside the hair. Henna is an orange dye commonly used as a deposit-only hair color whose active component, lawsone, binds to keratin. It is therefore considered semi-permanent to permanent, depending on a person's hair type. Most people will achieve a permanent color from henna, especially after the second dye. With repeated use the orange color builds up into red and then auburn. While "natural" henna is generally a red color, variations exist. These variations usually contain ingredients from other plants and even synthetic dyes. Indigo is natural dye from a plant (Indigofera tinctoria, suffructicosa, or arrecta) that can be added to henna or layered on top of it to create brown to black colors in the hair. Henna is orange, and indigo is blue, so as complementaries on a standard color wheel, the two colors' combined effect is to create brown tones. Like henna, indigo may fade after one application, but it becomes permanent on the hair with repeated use. Using a plant-based color such as henna can cause problems later when trying to do a perm or permanent hair color. Some store-bought henna contains metallic salts which reacts to hydrogen peroxide that is used in hair lightening. This may lead to unpredictable results, such as green or blue tones in the hair. Henna is a healthy way to color hair, as long as no metallic salts are used. In 2018, a system for making semi-permanent hair dyes from renewable waste blackcurrant (Ribes nigrum L.) fruit skins from the fruit pressing industry was developed. Anthocyanin pigments were extracted from the blackcurrant skin waste and formulated into hair dyes. The dyes showed high buildup on hair and gave an intense blue colour, which was stable to multiple washes. Hair dyes are cosmetic compounds that make contact with the skin during application. Because of this skin contact, there exists some health risk associated with use of hair dyes. Thus, hair dyes are regulated in the commercial marketplace and, as new toxicity data is generated for some hair dyes and health risks are discovered, some of these hair dyes are being legally restricted from the cosmetic marketplace. The European Union is particularly stringent with regard to health regulations. To ensure that hair dyes contain only safe substances, the European Commission adopted the Directive 2012/21/EU to restrict the use of around 45 chemicals in hair dyes. The directive on dyes is part of a general and comprehensive set of regulations, the EU Cosmetics Directive 76/768/EC. ^ Vedel-Krogh, Signe; Nielsen, Sune F.; Schnohr, Peter; Nordestgaard, Børge G. (2016). "Morbidity and Mortality in 7,684 Women According to Personal Hair Dye Use: The Copenhagen City Heart Study followed for 37 Years". PLOS ONE. 11 (3): e0151636. Bibcode:2016PLoSO..1151636V. doi:10.1371/journal.pone.0151636. PMC 4795553. PMID 26986063. ^ "The Celts". www.ibiblio.org. Retrieved 27 March 2018. ^ "Diodorus Siculus, Library of History - Exploring Celtic Civilizations". exploringcelticciv.web.unc.edu. Retrieved 27 March 2018. ^ "The ELEGY for Llywelyn". www.greghill.wales. Retrieved 27 March 2018. ^ Corbett, J. F. Hair Colorants: Chemistry and Toxicology; Micelle Press: Dorset, U.K., 1998; Thompson, R. H. "Naturally Occurring Quinones" Academic Press: New York, 1957. ^ BBC. "BBC - Radio 4 Woman's Hour -The History of Hair Dye". ^ Wecker, Johann Jacob (1661). Eighteen Books of the Secrets of Art & Nature. pp. 82–84. ^ Pointer, Sally (May 1, 2005). The Artifice of Beauty: A History and Practical Guide to Perfume and Cosmetics. The History Press. ^ "Schwarzkopf >COMPANY >History Milestones of success". Archived from the original on 2015-02-17. Retrieved 2015-01-14. ^ Morel, Olivier J. X.; Christie, Robert M. (2011). "Current Trends in the Chemistry of Permanent Hair Dyeing". Chemical Reviews. 111 (4): 2537–2561. doi:10.1021/cr1000145. PMID 21265503. ^ Wilson, Cynthia (6 August 2012). "Dip-Dye Hair Coloring Tutorial and Styles". Womenio. Retrieved 6 October 2012. ^ "Hair Color 101: Permanent Hair Color from Clairol Professional". www.clairolpro.com. Retrieved 2015-10-26. ^ "IARC working group on the evaluation of carcinogenic risks to humans: occupational exposures of hairdressers and barbers and personal use of hair colourants; some hair dyes, cosmetic colourants, industrial dyestuffs and aromatic amines. Proceedings. Lyon, France, 6-13 October 1992". IARC Monogr Eval Carcinog Risks Hum. 57: 7–398. 1993. PMID 7911535. ^ IARC Monographs Working Group on the Evaluation of Carcinogenic Risks to, Humans (2010). "Some aromatic amines, organic dyes, and related exposures". IARC Monographs on the Evaluation of Carcinogenic Risks to Humans / World Health Organization, International Agency for Research on Cancer. 99: 1–658. PMC 5046080. PMID 21528837. ^ Thyssen, Jacob P.; Søsted, Heidi; Uter, Wolfgang; Schnuch, Axel; Giménez-Arnau, Ana M.; Vigan, Martine; Rustemeyer, Thomas; Granum, Berit; McFadden, John; White, Jonathan M.; White, Ian R.; Goossens, Ann; Menné, Torkil; Lidén, Carola; Johansen, Jeanne D. (2012). "Self-testing for contact sensitization to hair dyes - scientific considerations and clinical concerns of an industry-led screening programme". Contact Dermatitis. 66 (6): 300–311. doi:10.1111/j.1600-0536.2012.02078.x. PMID 22568836. ^ "Household Products Database - Health and Safety Information on Household Products". hpd.nlm.nih.gov. Retrieved 2017-02-12. ^ Riaz, Almas (29 May 2016). "Shampoo for color treated hair". Tune Your Hair. The Hair Laboratory. Retrieved 12 February 2017. ^ Tukker, Arnold; Buijst, Harrie; Van Oers, Lauren; Van Der Voet, Ester (2001). "Risks to Health and the Environment Related to the Use of Lead in Products" (PDF). ^ Lamb, James (Feb 1997). "Reproductive toxicology. Lead acetate trihydrate". Environ Health Perspect. 105: 315–316. doi:10.2307/3433461. JSTOR 3433461. ^ "Does hair dye cause cancer?". Cancer Research UK. 20 July 2006. Archived from the original on 20 September 2007. Retrieved 29 July 2007. ^ DeNoon, Daniel J. (January 26, 2004). "Hair Dye Linked to Blood Cancer: Long-Term Use of Dark, Permanent Dye May Raise Lymphoma Risk". Web MD. Retrieved 2007-07-29. ^ a b Hair Dye Linked to Blood Cancer. Webmd.com. Retrieved on 2010-12-21. ^ Hair Dyes and Cancer Risk – National Cancer Institute. Cancer.gov (2009-10-09). Retrieved on 2010-12-21. ^ Gera, R.; Mokbel, R.; Igor, I.; Mokbel, K. (2018). "Does the Use of Hair Dyes Increase the Risk of Developing Breast Cancer? A Meta-analysis and Review of the Literature". Anticancer Research. 38 (2): 707–716. PMID 29374694. ^ Farooque, Sannia; Rose, Paul M.; Benohoud, Meryem; Blackburn, Richard S.; Rayner, Christopher M. (2018). "Enhancing the Potential Exploitation of Food Waste: Extraction, Purification, and Characterization of Renewable Specialty Chemicals from Blackcurrants (Ribes nigrum L.)". J. Agric. Food Chem. 66 (46): 12265–12273. doi:10.1021/acs.jafc.8b04373. ^ Rose, Paul M.; Cantrill, Victoria; Benohoud, Meryem; Tidder, Alenka; Rayner, Christopher M.; Blackburn, Richard S. (2018). "Application of Anthocyanins from Blackcurrant (Ribes nigrum L.) Fruit Waste as Renewable Hair Dyes". J. Agric. Food Chem. 66 (26): 6790–6798. doi:10.1021/acs.jafc.8b01044. ^ Maiti, Swati; Sinha, Sudarson; Singh, Mukesh (2015). "Hair Dye–DNA Interaction: Plausible Cause of Mutation". Cosmetics. 2 (4): 313–321. doi:10.3390/cosmetics2040313. This page was last edited on 11 April 2019, at 13:09 (UTC).